With this technical feature we will attempt to discuss, compare, and provide the information needed to decide which system is the best for particular applications. (ONE-WIRE, or THREE-WIRE, both with a built-in voltage regulator.) And we will discuss the advantages and disadvantages of each type when used in different applications. If the “ONE-WIRE” would have worked well with the complicated wiring involved for support of all the many accessories on cars, then over the years GM could have saved a fortune in wiring. But GM did not compromise electrical system performance in this area. They did spend more money for engineering and wiring to install the THREE-WIRE alternators, which will deliver best performance. And as we shall see, there really is value to the little extra work required to install the THREE-WIRE system. 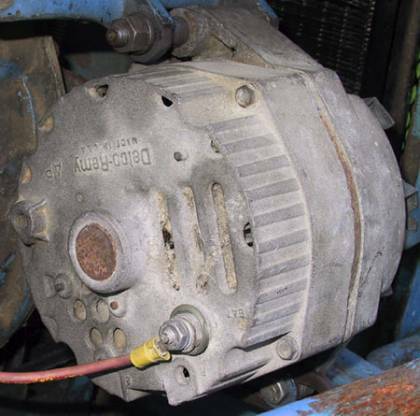 The “ONE-WIRE” alternator is best suited for applications that need the alternator only for a battery charger. Okay, so it’s a little radical to use an old farm tractor as a model in a site for High Performance cars. Ha! 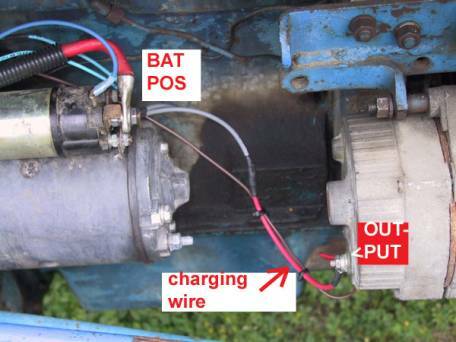 But the tractor example makes a strong point about the ONE-WIRE alternator system. And the wire harness on tractors and most other machinery is short in length, with fairly heavy gauge size wire. 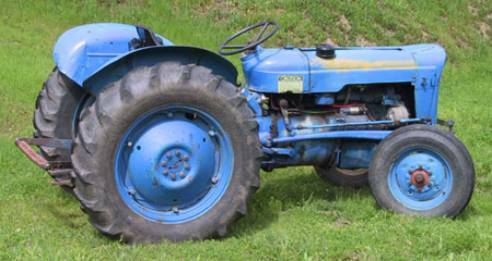 The ONE-WIRE alternator could satisfy the battery charging needs on this simple old tractor. It’s important to notice the short-in-length charging wire on the tractor. Significant voltage drop will not occur with the battery charging wire only a few inches in length. And there are no accessories to hook-up downstream from the alternator. The “remote voltage sensing” option available with the THREE-WIRE is not needed with this tractor application. However… Even the most simple of applications, like the old tractor, can use the THREE-WIRE type alternator with built-in voltage regulator (the two wire plug-in plus the “charging wire). Although it must be properly wired, the THREE-WIRE type does work equally well for the tractor application. The added benefit of wiring the tractor for the THREE-WIRE alternator is that replacements will be less expensive and more easily found. (Since the “THREE-WIRE” type was used on many years of all GM cars and trucks, it can be found at about any place where auto parts are sold, and usually for far less money than the special “ONE-WIRE” type.) And a Warning Light on the dash in addition to a gauge will be an option when the THREE-WIRE is installed. 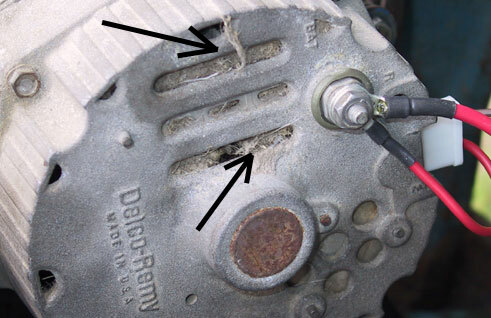 The difference between the ONE-WIRE and THREE-WIRE alternator is the voltage regulator. 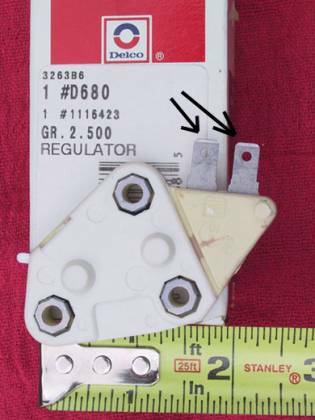 The Delco part # D680 voltage regulator shown above is used in both the 10SI and 12SI THREE-WIRE models. The same model of alternator can be assembled with different types of voltage regulators (for ONE-WIRE or for the THREE-WIRE system). We do have options, and the choice is ours to make. The voltage regulator for the “ONE-WIRE” alternator is often referred to as “SELF-EXCITING.” The “self-exciting” terminology probably comes from the old generator days, when testing the generator output required “exciting” the field winding (which involved powering-up the field winding so that it would make a maximum strength “magnetic field”). And the “self” part of the term comes from the voltage regulator turn ON function without the assistance of a dedicated wire circuit. The other of the two plug-in wires at the SI series alternator is the “voltage-sensing” terminal for the voltage regulator. Through the sensing-wire, the voltage regulator monitors electrical system voltage and makes adjustments to alternator output. The regulator will adjust alternator output as needed to maintain the place where the sensing-wire is routed (at about 14.2 volts). And the sensing-wire can be routed to a place remote from the alternator (downstream). 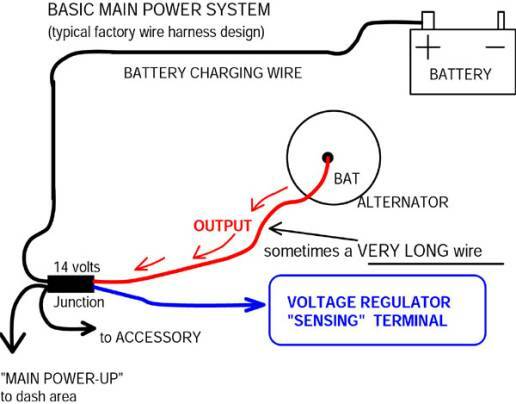 This “remote voltage-sensing” feature is often a big advantage when running with a factory type wire harness from the Muscle car period (60’s and early 70’s period cars and trucks). Then the alternator output will be adjusted according to what goes on far downstream from the alternator–at the main power distribution junction, which operates the whole car plus charges the battery!